Uniform in height, early flowering and plants are nicely branched. Tall flower spikes with pure white flowers and slight maroon spotting on the inner side of the trumpet-shaped flowers. 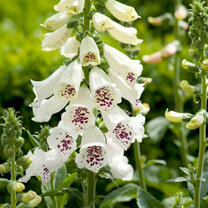 A slightly more compact form, giving an excellent garden performance. Flowers May-July. Height 40-50cm (16-20"). Supplied in a 9cm pot.